February 3, 1991, The pilots of 2 Cessna 182 aircraft took off from runway 10 in formation. 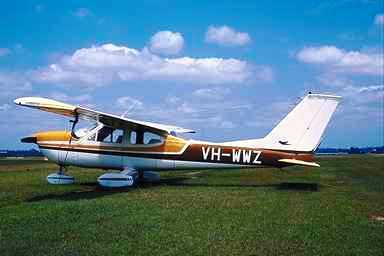 One of these, N6384a, had 4 skydivers aboard. After takeoff, the pilot of N6384a discontinued formation flight & departed to the southeast, while the other Cessna departed northeast. At about the same time, a piper pa-28, N4676r, was approaching the airport with a dual student & instructor (cfi) aboard. Subsequently, the 2 aircraft converged & collided about 1-1/2 mile southeast of the airport. No known witness saw the collision; the altitude & headings of the aircraft were not verified. During impact, the 2 aircraft became entangled & they impacted the ground at the same location. An investigation revealed evidence that the high wing Cessna & the low wing pa-28 converged laterally, while on flight paths that angled toward each other.